Annie made a wild discovery: Pan-fry our noodles with turmeric and they turn red! Why? Turmeric is a natural pH indicator. In contact with alkaline substances like our noodles, the orange-red carotene present in turmeric comes to the fore. And why are our noodles alkaline? Because ramen noodles include mineral salts called kansui that impart a resilient chewiness. Follow Annie's recipe to try this delicious chemistry experiment for yourself! Any green veggie can be used in this salsa verde, replacing the beans and cucumber. Think arugula, mixed herbs, and snap peas. The trick is to chop them really small. 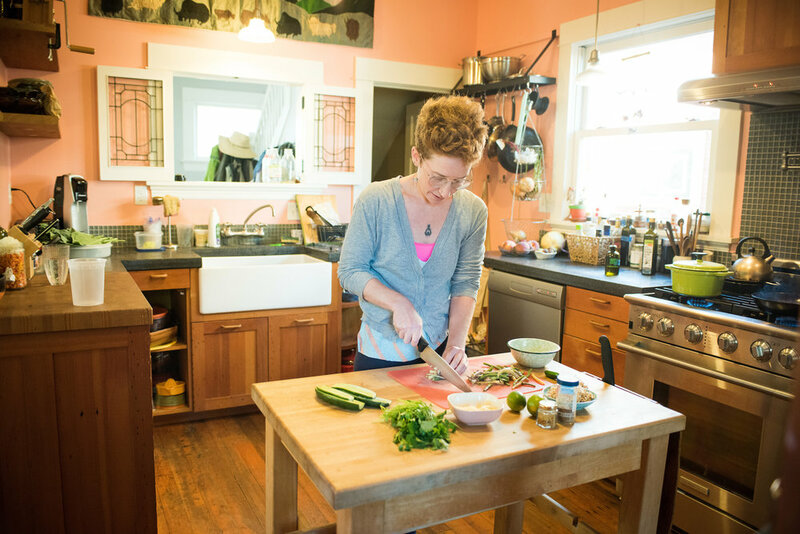 Annie also includes sprouted grains, and shares her recipe below. For those short on time, omit the sprouts. 1. In a sauté pan over medium-high heat, heat 2 tablespoons olive oil until oil is hot. A piece of green bean dropped in should sizzle. Sauté green beans, cumin seeds, and mustard seeds with a sprinkle of salt until beans are just barely tender and have a little sear to them. Turn off heat and let beans cool slightly. 2. In a bowl, place the cucumber, sprouted grains, cilantro, garlic, jalapeno, and 1/4 cup olive oil. Add the juice of 1 lime. Add beans and seeds. Stir. Salt and add additional lime juice to taste. 3. Bring a large pot of water to a rapid boil. Gently pull apart and fluff noodles. Add noodles to water and boil 2 minutes, stirring often. Rinse very thoroughly with cold water until fully chilled and then shake out excess water. 4. While noodles are draining, heat oil in your biggest sauté pan or a wok over medium-high heat. When the first noodles touch the pan, you should hear a lot of crackling sizzle action. Place all the noodles in the pan. Sprinkle in turmeric and begin to toss the noodles in the pan, using tongs or a spatula. Fully coat the noodles in the oil and turmeric. At this point, you'll begin to see magic happen as the noodles turn bright red. 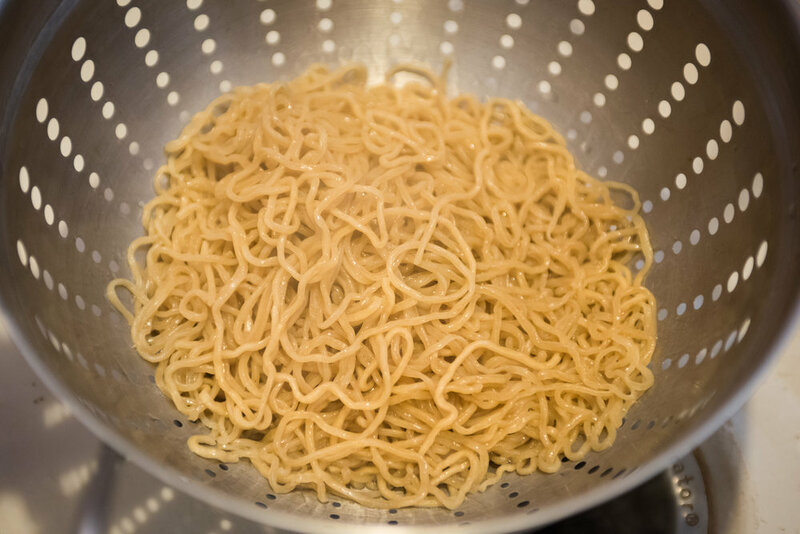 Once the noodles are red, let them sit for 15 to 30 seconds as they get crispy. Flip them over and let them crisp on a few sides. Be careful not to overcook. 5. Make a nest of noodles in the bottom of your bowl. Spoon desired amount of salsa verde on top. Bring any remaining salsa to the table with you, in case you want to re-up. Sit down, take a breath, and enjoy! 1. Soak whole grains, legumes, or seeds in water overnight. 3. In a flat-bottomed Tupperware or sheet tray, lay down several layers of paper towel. Spread out in a thin layer of the grains, legumes or seeds—not more than 4 or 5 kernels deep—so they have plenty of room to breathe. Put a lid on the Tupperware to maintain some warmth and moisture. Think tiny greenhouse. 4. Every day, rinse and drain your grains, legumes, or seeds, placing them in the Tupperware or on the sheet tray again. Change out the paper towel if it has gotten soggy. If your container is very warm, leave your little greenhouse in the fridge at night and pull it out to room temperature during the day. Typically, you'll see a few long tails emerge first. I like to wait until a thicker shoot emerges, to bring out a little more verdant sweetness. This should take 3 to 4 days. 5. Once you have sprouts, keep them in a Tupperware or mason jar in the fridge and put them on everything! They can also be baked into cookies, breads, muffins, etc.